Starting at only £15 per user per month! What Do You Want the Next Chapter of Your Business Story to Be? Having access to accurate, real-time data is the most basic requirement when it comes to making key business decisions. Now you can take that to the next level with a cloud-based analytics solution that easily integrates with any of your other cloud-based services. Accounting software, ERP solutions like SAP Business One, Google, Sales Force, Concur… and the list goes on. 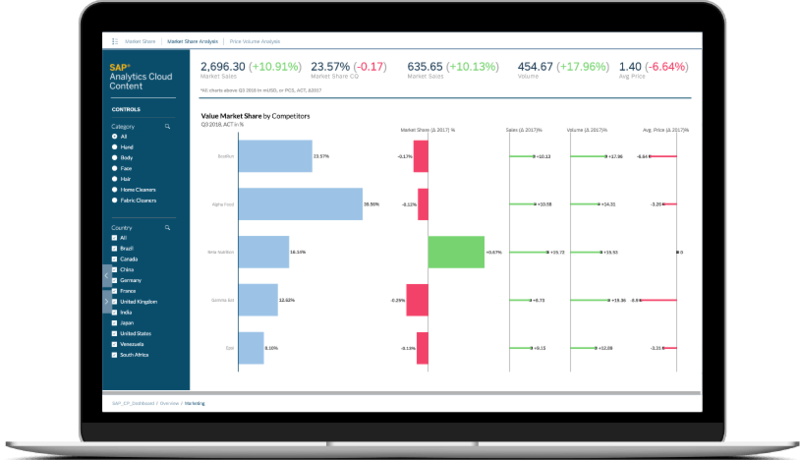 The answers you are looking for - all your data on one screen to make decisions that will take your business to the next level. 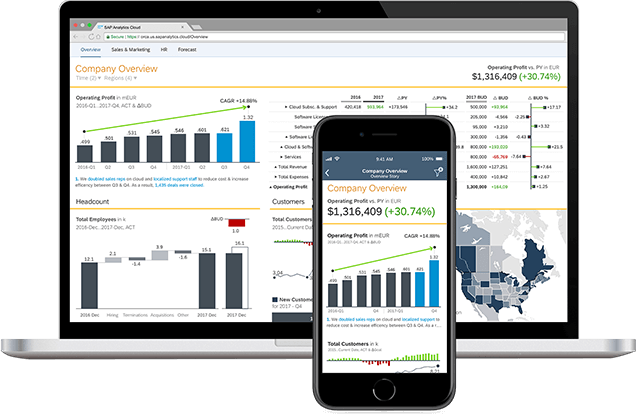 SAP Analytics Cloud incorporates machine learning technology and embedded artificial intelligence help you to discover deep insights, simplify access to critical information, and empower informed decision making for all. By creating stories/scenarios specific to your business or industry, you can unlock the answers and options to solve issues and grow your business. Focus on what’s most important and let SAP Cloud Analytics take care of the rest for you. Centralized intelligence, automatic insights, integrated planning and interactive results are within your reach. 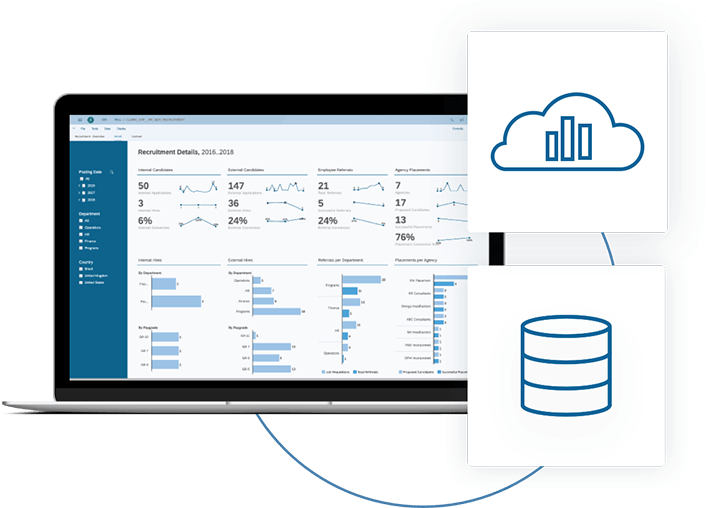 Whether your data resides on premise or in the cloud, all your business reporting will never be the same again with SAP Analytics Cloud. It is a single solution for business intelligence and organizational planning, enhanced with the power of predictive analytics and machine learning technology. 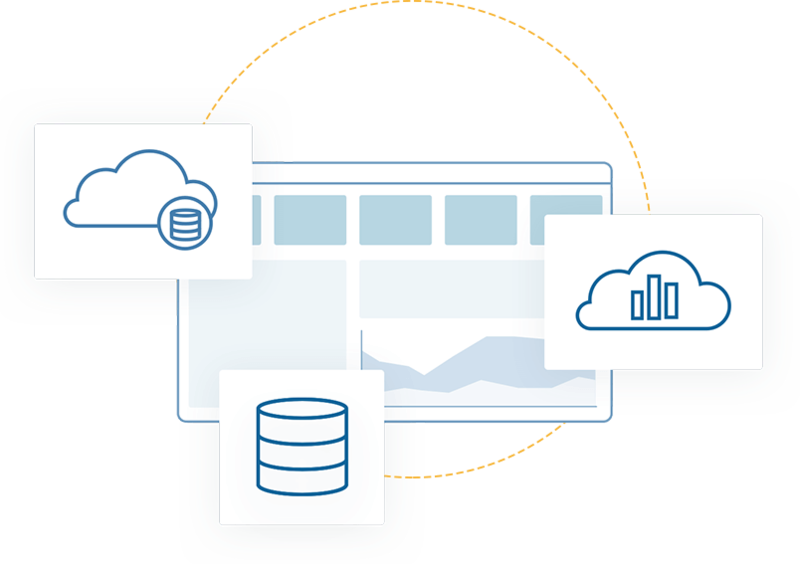 The key benefit of SAP Analytics Cloud is that the integrations for data reporting are limitless. 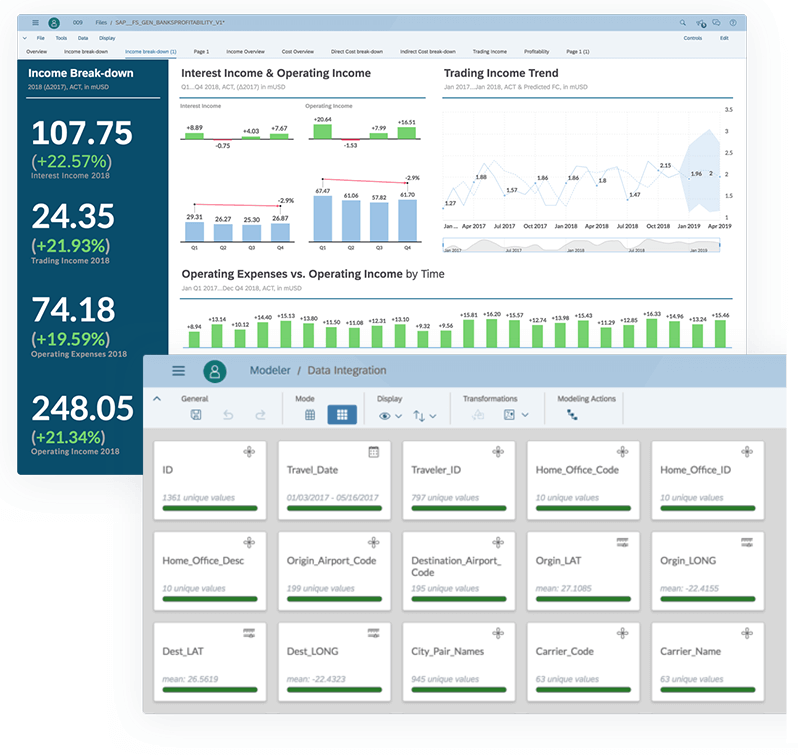 Whether you are using basic accounting software, SAP Business One or any other applications, SAP Analytics Cloud allows you to bring these data sources together for powerful insights – in a visual representation that is easy to understand and dive deeper. The solution enables your team to review, plan, and collaborate from anywhere. Want to know why your sales are down? Need to figure out how a price discount could influence quantities sold in each sales region? It’s all possible. You just need to drag and drop to create your own story – let SAP Analytics Cloud do the rest. Automatically gain insight from any level of detail with augmented analytics features powered by artificial intelligence and machine learning technology. SAP Analytics Cloud helps you discover key influencers of past results to simulate future scenarios and predict outcomes. 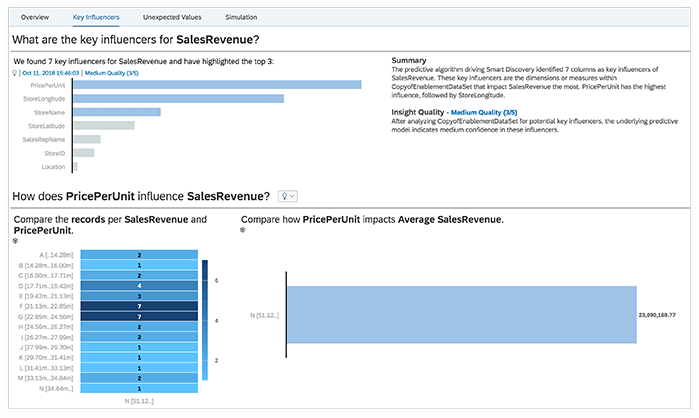 Go from insight to action in minutes having access to deep insights in less time. Make meaningful decisions by revealing the story of what drives your business. 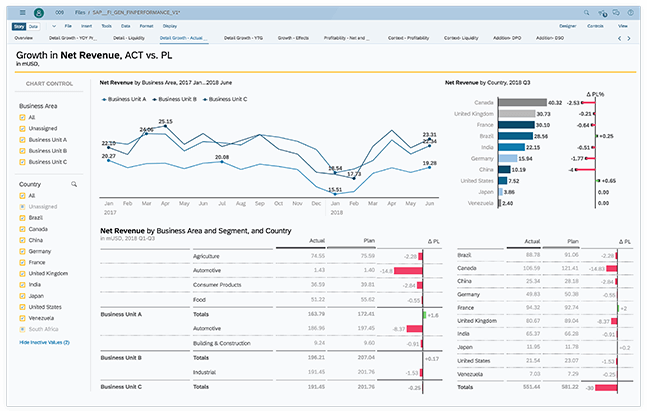 Planning and analysis is made simple through SAP Analytics Cloud. You can visualize the impact of your decisions with “what-if” scenarios that give you the full picture of your business to help you plan the next business move. Increase your agility as a growing business by being able to respond in the moment with the right data at your fingertips. Whether your data resides on-premise or in the cloud, you can combine the best of both worlds for intelligent decision making. Using a cloud solution doesn’t mean you have to sacrifice your existing on-premise investment. Gain one seamless experience and shared functionality between both. Put all your software investments to work together like never before with deep data connections. Finance, sales and marketing, operations, HR and more - find out how different lines of business can use SAP Analytics Cloud to take their operations to the next level. Empowering your team with information will improve results from marketing campaigns through to sales revenue.